Security giant G4S’ annual general meeting (AGM) was interrupted by human rights activists on Thursday protesting against the firm’s controversial links to Israeli jails, where Palestinians are tortured. The activists accuse G4S of enabling Israel’s occupation of Gaza, the West Bank, and east Jerusalem and supporting Israeli human rights violations. G4S' 2015 AGM was held in the ExCel convention center in the Dockland’s district of East London. It marked the fourth intervention since 2011 by political activists at the annual affair. 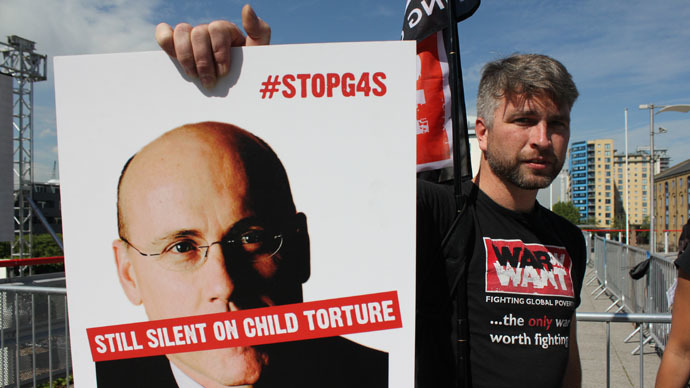 Activists present questioned G4S chief executive Ashley Almanza and chairman John Connolly on a number of controversial issues. As they criticized the security company’s complicity in Israeli human rights violations, the meeting descended into chaos. The campaigners represented a range of groups, including the Palestine Solidarity Campaign (PSC), London Palestine Action, Stop G4S and War on Want. They had each bought a share in the firm to secure access to the event. The activists far outnumbered shareholders at the meeting, according to the PSC, as their voices overpowered those of genuine investors. Key questions posed centered on G4S’ contracts with the Israeli administration. In the face of the intervention, genuine shareholders present managed to ask a mere two questions over the course of the meeting. As the AGM progressed, it was frequently disrupted by activists who stood up from their seats and informed G4S representatives and shareholders of how Palestinian men, women and children are being detained and tortured in G4S-serviced prisons. Some campaigner’s donned masks illustrating the face of a Palestinian prisoner whose story they were recounting, while others blew whistles. In a mark of silent protest, yet others cast hundreds of scraps of paper on the ground bearing the faces of Palestinians detained in Israeli jails. As the pieces of paper lay scattered on the floor, G4S reportedly attempted to usher the meeting forward. When campaigners stood up and began to address audience members around them, a group of G4S security guards reportedly approached them. The majority of activists present were eventually removed from the premises. Despite being a publicly listed firm, G4S allegedly outlawed all attendees from bringing mobile phones into the meeting room. Other recording devices were also confiscated from attendees as they made their way through security cordons complete with hand-held scanners and x-ray machines. Despite these measures, London Palestine Action smuggled a recording device into the room, and filmed the removal of two campaigners as they decried Israel’s 8-year siege of Gaza. Campaigners also repeatedly asked when G4S would be scrapping its contracts with Israeli military, prison and police services. G4S chief executive Ashley Almanza said this would occur before 2018. As the interrogation about G4S’ Israeli contracts continued, both Almanza and the firm’s chairperson John Connolly flatly refused to offer further responses. They did, however, say internal and external analysis of their firm had revealed its activities are compliant with international law. Despite these claims, the firm provides a range of security services to Israel’s prisons, where Palestinians are routinely detained without charge or trial. It also provides specialized equipment and maintenance services to Israeli military checkpoints scattered across the West Bank. The military posts in question restrict Palestinians’ freedom of movement throughout the Occupied Territories. Human rights advocates in Israel and elsewhere also warn of the torture and abuse of Palestinians in Israeli jails at the hands of Israeli officials. Ryvka Barnard, Global Justice Campaigner at War on Want, praised Thursday’s intervention. “G4S executives looked rattled today in the face of determined campaigners, taking them to task for their complicity in human rights abuses around the world,” he told RT. Prior to the AGM, War on Want partner in the Occupied Territories, Randa Wahbe, said that G4S is complicit in the unlawful detention of Palestinians. “G4S continues to be complicit in the illegal detention of thousands of Palestinian political prisoners, including children, women, Palestinian Legislative Council members and university students,” he said. G4S controversially lost £50m ($76.8m, €68.1m) after neglecting to train and hire a sufficient number of security guards for the 2012 Olympic Games in London. The scandal-ridden firm’s share price dropped by 1.08 percent on Thursday.